Brooklyn June 26th 2016 Wrap Up! Thanks so much to all the amazing zombies who helped make our first event of year 10 so amazing! Check out all the video, photos and press below with your beautiful zombie faces, including a photo gallery and Feature article in the NEW YORK TIMES! We also have limited edition T-shirts on sale now! The official wrap video from Rollersteady.com! Photo gallery from John Christou Photography! Photo gallery from Ed Campbell of Rebel Image Photography! Tattooed Zombie Girls on Inked Magazine! 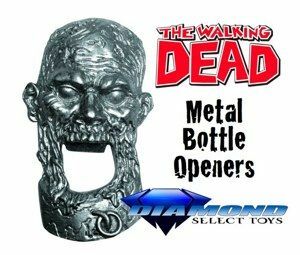 – Tattooed Zombie Wrap up video on Inked Magazine! Article on Blumhouse.com about the new movie from Backseat Conceptions and director Michael Walker, CALL SHEET!! Here is the official video from Inked Magazine and Rollersteady.com showcasing all the tattooed zombies at the event! 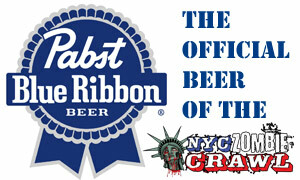 Special thanks to all our amazing sponsors including Pabst Blue Ribbon, Not Your Father’s Root Beer, Inked Magazine, Steadfast Brand, Shaw Promotion & Halloween Adventure NYC as well as our venues BAR MATCHLESS, THE CHARLESTON & BLACK BEAR BAR and incredible makeup artists including the gang from THE HAUNT AT ROCKY LEDGE! And our co-hosts Inked Girls FALLON VENDETTA and KALI FELINE! 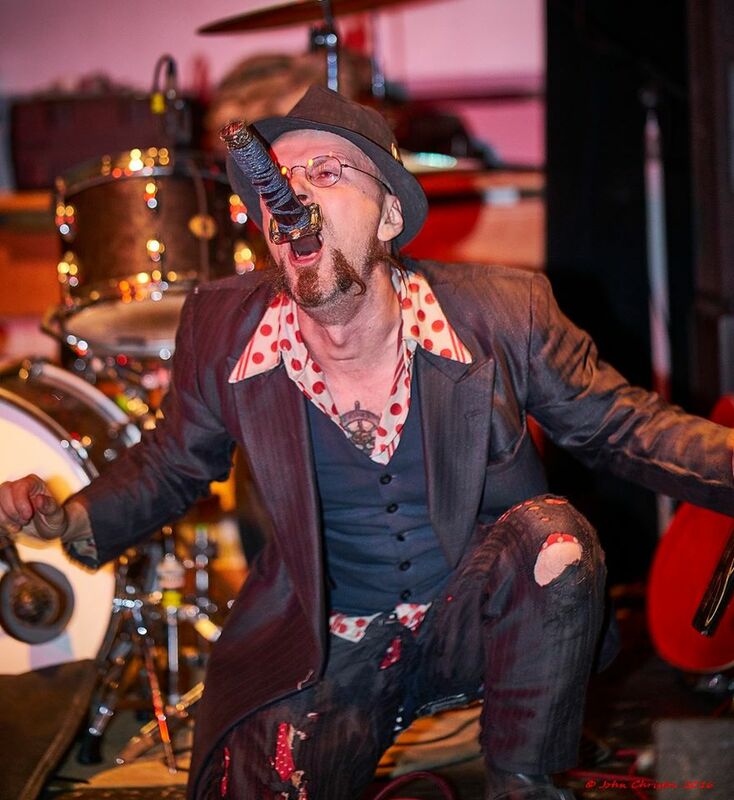 And of course the event would not be complete without all the amazing performances from UNCLE JAKE AND THE 18 WHEEL GANG, JUNGLE JUNKIES, SCREAMIN’ REBEL ANGELS, NP PRESLEY AND THE GHOST OF JESSE GARON , SQUIDLING BROS. CIRCUS SIDESHOW and SKINDICATE SUSPENSION! Also our opening reception acts JESS-O-LANTERN & Mike Gallagher from SPARKLEFIGHT! And thanks to the FOOD BANK NYC for helping us collect cans for the homeless! We have so much more coming up for 2016 you will not be disappointed! First up is going to be the new hit new interactive comedy experience ‘The Zombie Wedding‘ (from the producers of ‘Tony and Tina’s Wedding’) returns to NYC on July 8th! The show will hit Manhattan at The Cutting Room (44 E 32nd Street, NYC). There will be a pre-wedding reception at 6:30pm with Free Zombie Makeup and the show will start at 8pm. You can buy your tickets HERE before they sell out! 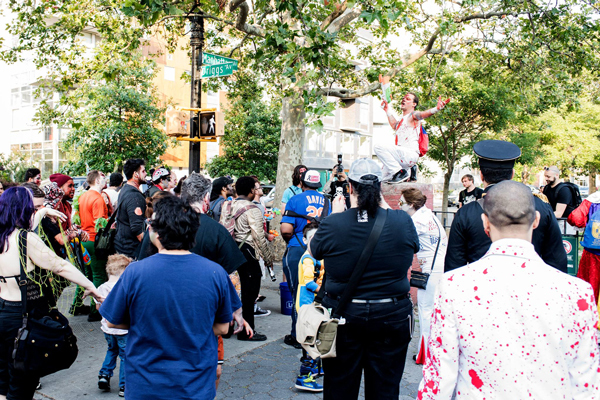 Use the code NYCZOMBIE when buying your ticket for $5 off from the NYC Zombie Crawl! We’ll also be working with the Walker Stalker Convention on July 9th and 10th in New Jersey! It’s your chance to meet many of the start of the Walking Dead and much more! More details on that soon but you can check out all the amazing guests and vendors and get your tickets at www.walkerstalkercon.com! YEAR 10! 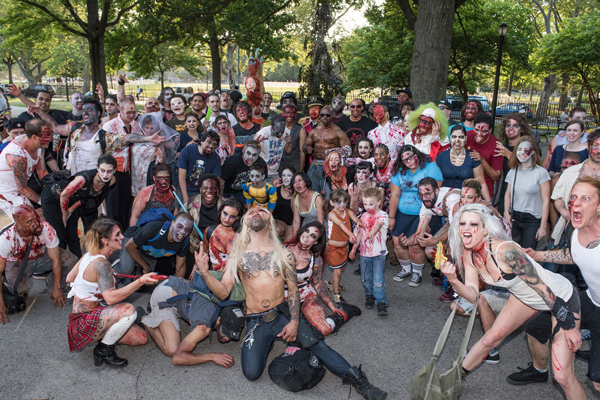 2016 NYC Zombie Crawl takes Brooklyn June 26th! UPDATE 6/25- Check out videos of all the acts performing below! The opening party at Bar Matchless at 4p will include a performance from Jess-O-Lantern & Mike Gallagher from Sparklefight and we’re also doing a canned food drive for the homeless with Food Bank NYC so bring your canned goods to the first stop to donate! This year is going to be extra bloody, if you bring a water gun or super soaker we will help fill it up with blood at the beginning of the crawl at 6:30pm outside of Bar Matchless for a blood fight in McCarren Park! Please do not bring any guns that look like real guns and be a courteous zombie, only spray those who are consenting! Do not spray passerbys or any public or private property!! Also any Zombies looking for a sober driver or need a ride to and from the event? Unlock $50 IN FREE LYFT RIDES by texting the keyword “UNLOCK50” to “31996” or download the free app from www.Lyft.com and enter promo code “UNLOCK50” in the payment section before requesting a ride! 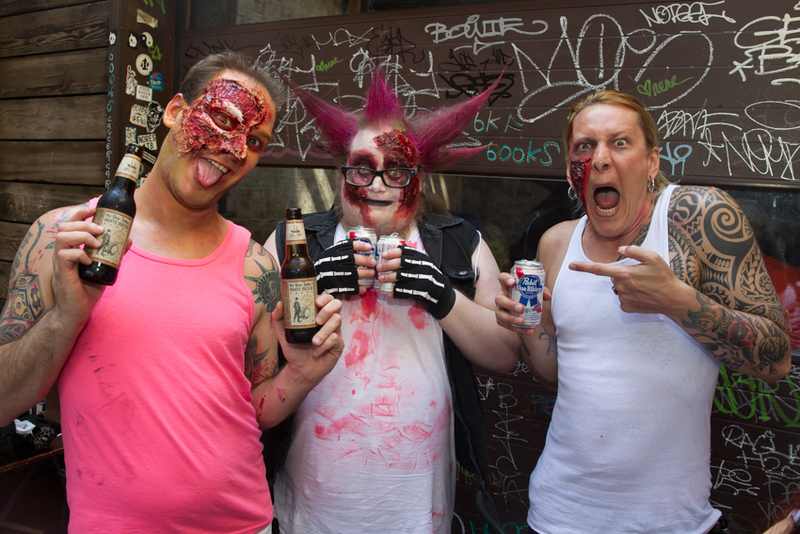 And check out the top 5 reasons to join the NYC Zombie Crawl this year on FANGORIA!! We hope you are all ready for year 10 because it’s going to be the biggest and best yet! 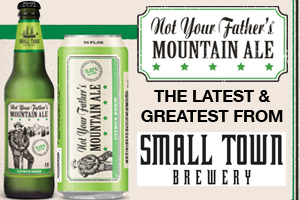 We have new sponsors for 2016 including Not Your Father’s Root Beer as well as Inked Magazine and Steadfast Brand who will be presenting awards and prizes for the best tattooed zombies! 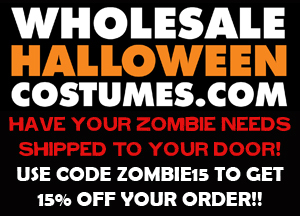 We’ll be shooting photos and videos for the search so come wearing your zombie finest! 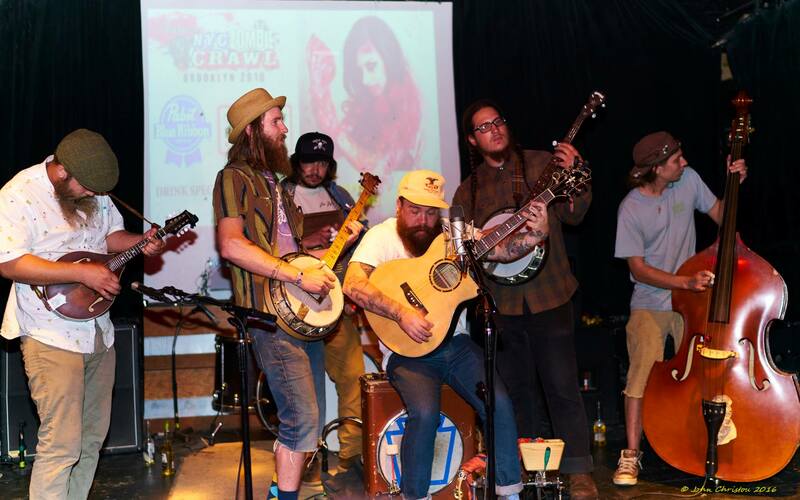 It’s all going down on SUNDAY, JUNE 26th in Brooklyn for our 10th crawl in Williamsburg! 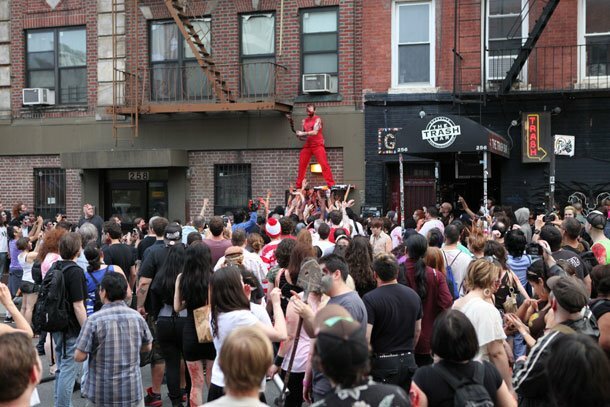 The NYC Zombie Crawl is back for its 10th annual lurch around Williamsburg on Sunday, June 26th! 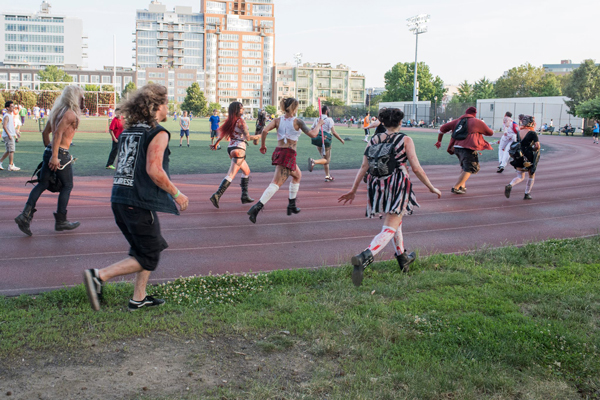 The zombie shenanigans will include zombie games at McCarren Park and the notorious Hot Zombie Contest at the afterparty with live music, comedians, zombie burlesque, sideshow performances and more! The NYC Zombie Crawl will begin at 4pm at BAR MATCHLESS (557 Manhattan Avenue, Brooklyn NY) with our usual FREE zombie meet-up! You must be 21+ to enter the bar and for 2 and 1/2 hours! This includes a live music performance from Jess-O-Lantern & Mike Gallagher from Sparklefight and we’re also doing a canned food drive for the homeless with Food Bank NYC so bring your canned goods to the first stop to donate! Zombies are invited to hang out while our zombie technicians will be providing makeup for civilians who wish to become undead for a small fee (starting at $10). 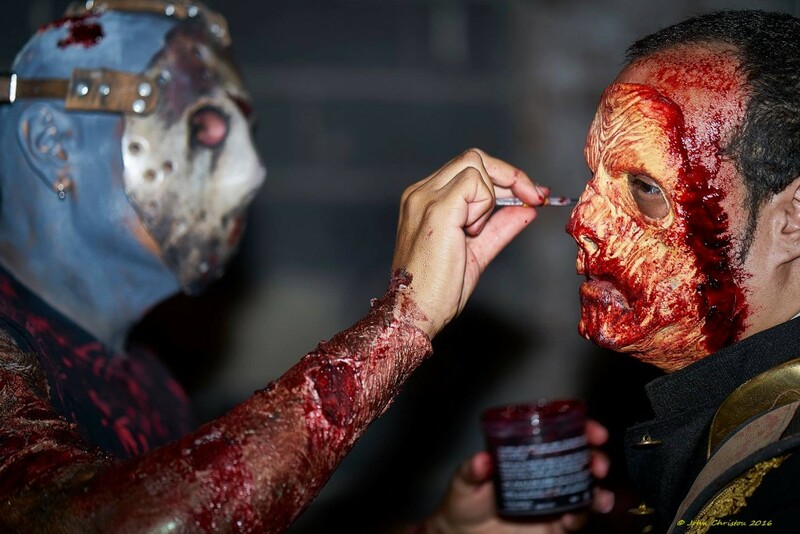 Makeup artists will include the crew from THE HAUNT AT ROCKY LEDGE and Drink specials will be provided all day and night by Pabst Blue Ribbon and Not Your Father’s Root Beer starting with $1 drinks between4-5p at Bar Matchless! At 6:30pm, Zombies will depart and roam through the wild streets of Williamsburg, first through McCarren Park for a Zombie photo opportunity before heading to a Zombie Pizza Party at THE CHARLESTON (174 Bedford Avenue) FREE BAR PIZZA with every drink, alcoholic or not! UNCLE JAKE AND THE 18 WHEEL GANG: Featured in the new movie Call Sheet, a bluegrass Jug band with a down home feel! JUNGLE JUNKIES: Brazilian metal madness returns to the NYC Zombie Crawl! SCREAMIN’ REBEL ANGELS – NYC Rock n’ Roll Soul and Rockabilly at it’s finest! NP PRESLEY AND THE GHOST OF JESSE GARON – Classic Rock n’ Roll fronted by the spawn of Elvis Presley’s cousin! We also have world premiere sneak preview clips from the new horror movie from Backseat Conceptions and director Michael Walker, CALL SHEET!! And Sideshow Performances from the SQUIDLING BROS. CIRCUS SIDESHOW and SKINDICATE SUSPENSION! – We’ll also have the return of the HOT ZOMBIE CONTEST and COSTUME CONTEST where we will be presenting awards for categories including Best Tattoos from Inked Magazine and Steadfast Brand, most original, most bloody, best SPFX and more! Co-hosted by Inked Girls FALLON VENDETTA and KALI FELINE, A cash prize will be announced and more from our sponsors Pabst Blue Ribbon, Halloween Adventure, Troma Entertainment, Backseat Conceptions! More to come, stay tuned!! CHECK OUT THE ACTS THAT WILL PERFORM AT THE EVENT BELOW! 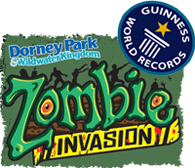 Mention ‘Zombie Crawl’ at Halloween Adventure! Sponsored by Halloween Adventure (104 4th Ave @ 11th St, NYC) Mention "NYC Zombie Crawl" when buying makeup and props and you'll get 10% off your purchase all year long!